Why and for what role? And, whilst I am not an armoured specialist, is that huge grill atop the cabin a RPG trap? 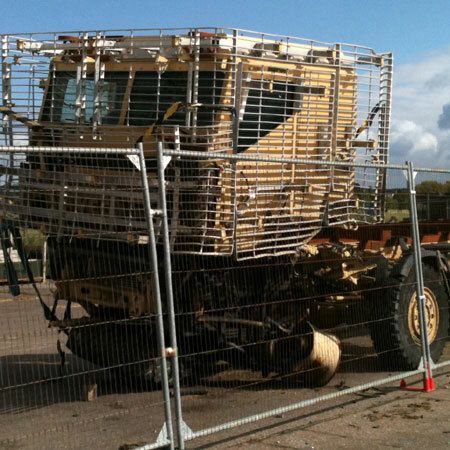 If our logistic lines require armour then, gosh, we are in trouble. Keep the logistic line simple, affordable and efficient. FT – the media sets the MOD procurement strategy so ‘protecting our boys (and girls)’ is the highest priority – highly commendable. But the media has no concept of the breadth of Army logistics tasks so every single truck must be armoured, even if its entire service life will be spent running goods between Catterick & Otterburn. Obvious eh? Duty of Care and all that. The lump on the cab roof is the air con unit, the cab roof proper is under that. The cab roof will be armoured (to some level) and no doubt there is armour protection over the air trunking between air-con & cab. There are lots of light-armour vehicles in that vid’. If your escorts are light then why should your loggies be heavy? Armoured scouts make sense: Armoured logistics seems overkill. Well’ unless you want to spend yonks in an empty desert filled with ungrateful students. Basically; why are we buying a 40K-tonnes SV and yet – still – looking to buy an up-armoured version of the Bedford 17-pounder Portee? In the future the only un-armoured vehicles will be civilian ones a long way from the fighting. The days of taking a civilian model off the production line and painting it olive drab are long gone. In that case it will not be fitted with armour, only vehicles on ops get the armour. Armouring logistics vehicles has been happening for as long as I can remember, look at pictures of some countries logistics vehicles in the Balkans during the early to mid 90’s. I worked with the BELUGA contingent and every one of their vehicles was armoured, we added make shift armour plates to our DROPS wagons as well. If the last two operations have taught us anything it’s that your logistics are vulnerable.